American geologist and ethnologist, born at Mount Morris, New York, on the 24th of March 1834. His parents were of English birth, but had moved to America in 1830, and he was educated at Illinois and Oberlin colleges. When the Civil War broke out he entered the Union Army as a private, and at the battle of Shiloh he lost his right arm. He continued, however, on active service and served as division chief of artillery before Vicksburg, reaching the rank of major of volunteers. In 1865 he was appointed professor of geology and curator of the museum in the Illinois Wesleyan University at Bloomington, and afterwards at the Normal University. In 1867 he commenced a series of expeditions to the Rocky Mountains and the canyons of the Green and Colorado rivers, during the course of which (1869) he made a daring boat journey of three months, through the Grand Canyon, the river channel not having previously been explored. In these travels he gathered much valuable information on the geology, and he also made a special study of the Indians, and their languages. His able work led to the establishment under the U.S. government of the geographical and geological survey of the Rocky Mountain region with which he was occupied in 1870-79. This survey, with those of Ferdinand Hayden (1829-1887) and Captain George M. Wheeler (b. 1842) was incorporated with the United States Geological and Geographical Survey under Clarence King (1842-1901) in 1879, when Powell became director of the Bureau of Ethnology, a department he had assisted in founding. On King's resignation in 1881, Powell was appointed director also of the Geological Survey, a post which he occupied until 1894. To him the present thorough organization of the U.S. Geological Survey is largely due. 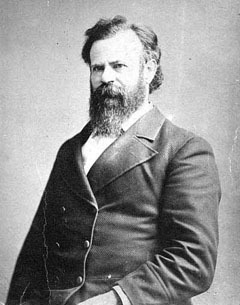 His principal publications were Exploration of the Colorado River of the West and its Tributaries (1875), Report on the Geology of the Eastern Portion of the Uinta Mountains (1876), Report on the Lands of the Arid Region of the United States (1879), Introduction to the Study of Indian Languages (1880), Canyons of the Colorado (1895), Truth and Error (1898). Especially important were his observations on what is now termed the "Uinta type" of mountain structure: a broad, flattened anticline, from which the strata descend steeply into bordering low grounds and quickly resume their horizontality -- being sometimes faulted, and affording evidence of enormous denudation. He died in Haven, Maine, on the 23rd of September 1902.